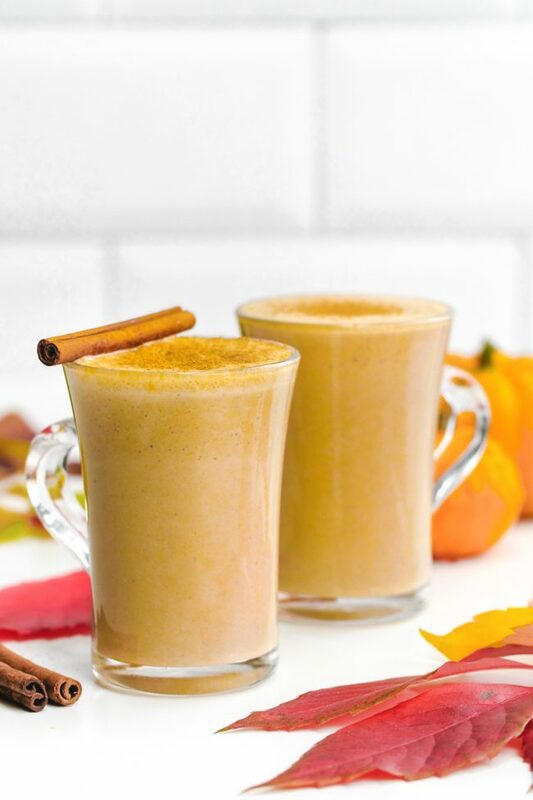 This pumpkin chai latte is lightly sweetened with maple syrup and is full of warm, cozy fall spices! I sure wish I had some Halloween goodies to share this week. But instead I’m bringing you this pumpkin chai latte! It’s really tasty… just not very fun. If you’re looking for something more Halloween-y, try these spider cupcakes. 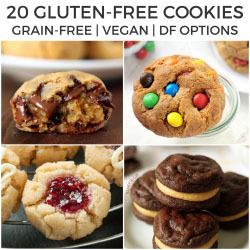 They have whole wheat, gluten-free and grain-free options! For something super healthy that pretty much any kid should be able to eat, try these healthy Halloween monster mouths. I originally posted this pumpkin chai latte recipe 6 years ago and am posting it again because more people need to see it! I’m also having major issues finding time to develop new recipes. I’ll be back from maternity leave starting in February, though, so things will get back to normal around here soon! My son is almost 1 year old and still wakes and drinks every 45 minutes throughout the nights on most nights. There are exceptions but not many! And sleeping through the night? Haha. Nope. Not once. I’m so tired. Almost all the time. This tea helps! It’s especially great for someone like me who doesn’t like coffee. This recipe is just pumpkin, maple syrup, pumpkin pie spice, vanilla, black tea and milk. It’s hard to go wrong with an ingredient list like that, right? If you like that flavor combination, be sure to check out my pumpkin spice latte Nutella muffins. Homemade chocolate hazelnut spread makes them paleo and dairy-free! 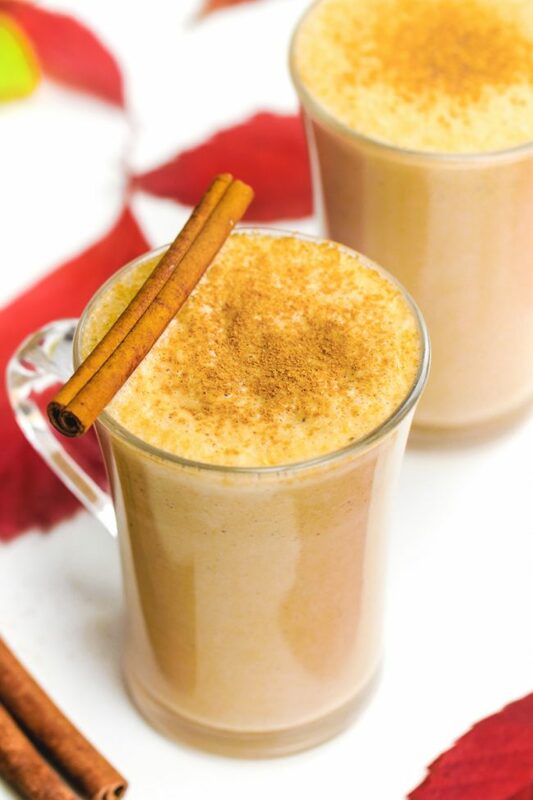 You can use whatever type of milk you’d like in this pumpkin chai latte. Make sure to use dairy-free milk for paleo and vegan. If you use canned coconut milk, I recommend watering it down. Use 1 cup (or even 1/2 cup) coconut milk and the rest water. It’s really rich otherwise. And if maple syrup isn’t your thing, use whatever sweetener you want. I just really love maple with pumpkin and all those fall spices! This drink would be a great addition to your Thanksgiving table. Make a huge batch and keep it in the slow cooker. And don’t forget this paleo vegan pumpkin pie! I keep trying other pumpkin pie recipes so I can post a nut-free version but none of them are even close to being as amazing as that cashew-based version. Definitely give it a try if you can have nuts! In a small saucepan, bring all the ingredients, except for the tea bags, to a boil over medium heat. Remove the saucepan from the heat, add the tea bags, and let the tea bags steep for 3 minutes (or however long the tea bags say). Sprinkle with some cinnamon before serving if desired. You can replace the different spices with pumpkin pie spice. Use 1/2 + 1/8 teaspoons. If you use canned coconut milk, water it down a bit. 1 cup or less of coconut milk and the rest water. 100 comments on “Pumpkin Chai Latte (paleo, vegan options)” — Add one! It’s so funny, I make both my own pumpkin latte and a chai latte but never put them together. It sounds and looks delicious though. Can’t wait to try is. I adore chai and chai lattes, this looks so delicious! Cozy and refreshing at the same time. This looked SO good that I even made it before I left for work this morning. Thx so much for this delicious treat! You’re welcome! I love that you had to make it before work even. :) I’m so happy that you enjoyed it! Thanks for your comment. This was extraordinary!! I made a batch for my husband this morning, and plan to make it for my family over the holidays. The only thing I did differently was add some extra maple syrup. Thanks for the great recipe!!! Extra maple is always a good thing. ;) I’m so happy you enjoyed the tea! Thanks for your comment! I am excited to try this pumpkin chai latte NOW!! Also, have you ever seen a naturopathic doctor? You may need some adrenal support, allergy testing, vitamin D, things like that! I hope you’ll enjoy it! I have seen a naturopathic doctor but didn’t get much help. I’m still trying to get the bottom of all my health issues but I think I’m getting there. :) Thanks for the tip! Thanks for the yummy recipes!! If you’re still feeling tired try an adrenal support vitamin, take one at breakfast and one at lunch. Also get some b vitamins in liquid form. Take morning and lunch as well! They work wonders. Another great supplement is trace minerals brand powders. You can mix with water for an afternoon burst. They are sort of like emergen c except packed with more minerals. You can buy all of that on Amazon. Hope that helps! I had similar health issues. Even though several tests showed normal thyroid health, an endocrinologist put me on thyroid meds. It made a drastic difference and suddenly I had my energy back. I remained on those meds for years, no problems. After my mom had severe health problems and we finally discovered the cause was gluten-sensitivity (not Celiac) I wondered if maybe that is why my thyroid wasn’t working properly. I got tested (a stool test, not blood) and discovered that I was also gluten sensitive. Long story short, I went completely GF and eventually was able to taken off the thyroid meds. Everything is working now! As long as I stay away from gluten (I’m also unable to eat soy) my energy level is good and a variety of minor issues I used to have no longer bother me.. Food sensitivities can really mess with your body. I used Enterolabs for my testing. I hope you feel better soon! Hi, Trish! Thanks so much for your comment. :) I’m happy that you were able to get to the bottom of what was causing your health issues. That’s great! Supposedly I don’t have either of those conditions but I’ll ask again the next time I’m at the doctor. Thanks again! Have you had your adrenals checked? Your adrenals control a lot of function in your body and it is done through saliva testing throughout the day. It sounds like this is what is the root of your exhaustion. You may want to also get your baseline hormones tested. I go to Progressive Medical in Austin as they are very familiar with getting to the actual cause of the problem. This sounds yummy! I love both Chai tea and pumpkin so it should be a great combination! I hope you have found a solution to your health issues by now. It could be allergies or food sensitivities, which are pretty widespread. I would also recommend checking out a website, stopthethyroidmadness.com. There are a lot of symptoms, including fatigue, which can be associated with Thyroid issues. It is often unrecognized or mis-diagnosed. This site and the book can really help you do your own research and be prepared to talk with your doctor about the tests and treatment that you really need. Most doctors don’t pay attention to your symptoms and brush it off if they think tests are normal. 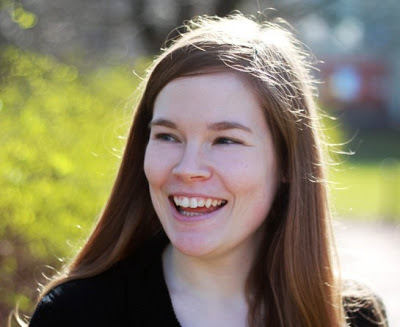 It was years before I found a doctor who listened to me and paid attention to my actual symptoms and actually did the additional tests needed to diagnose me with Hypo-thyroidism. Good luck and I hope you are feeling better! Thanks so much for your comment, Nanettel! I still have the same health issues. I’ve been tested for thyroid issues but all the tests come back normal but like you said, tests don’t say everything! I’ll definitely take a look at that website. I hope that everything is going well for you now that you’ve found a doctor who will listen to you and treat you properly. :) Thanks again! Thanks for the recipie! You may be gluten intolerant or celiac. What you descibed was exactly how my mom and I were before diagnosis. Hope you feel better! You may be anemic.there are different types of anemias which need specific tests for detection.on the other hand there is a long list why fatigue cannot be overcome.for the basics try good and fresh air in the house.during daytime use sunlight as the artificial light sources also causes fatigue.use fresher scents of lemon.i hope you are not unhappy about something and of course are you comfortable with the place you sleep. Thanks for your advice, Meme! I know I’ve had tests for anemia but I’m not sure how specific they were. I’ll ask my doctor next time I go. I do use sunlight when it’s available but between October and April, there’s rarely any sun where I live. Which is probably part of the problem. :( Thanks again for the tips! WOAH, I can’t wait to try this! I plan on making homemade coconut milk tonight, so this is perfect! Wow, I just made this, it is my new all time favorite!! I recently found out that I am insulin resistant and I am having to cut out processed sugars. Chai was the first thing to go, but is has gotten harder to abstain as the weather gets colder. You are my savior, thanks for sharing! Hello Erin! Great recipe for pumpkin latte…btw, if you are still feeling tired with or without naps etc…you may want to have your Vitamin D levels checked…I was feeling this way about 6months ago…..had some bloodwork done… and this came up 4 me….got VitD supplement and started doing juice cleanses and wow…my energy is BACK! Just a thought…read yr blog above and it sounded incredibly familiar! Good Luck and great blogging! Hi there! I just have a little Vitamin D deficiency. I'm taking it anyway as the doctor said it wouldn't hurt. :) I'd be so happy if it'd help! I'm glad to hear that it worked for you. It must be great to find out the solution to such a problem. I hope I will some day. :) Thanks for your advice! Can't help but post in regards to gluten intolerance…sorry, but it sounds very suspiciously so. Yup, it's a pain. But the negative reinforcements keep me on the straight and narrow, so to speak. Actually, it may be a good plan to be tested while you still have gluten in your system; you are much more apt to get a positive reading. Hope you can find the help you need! Sorry for my slow reply! I've already started my gluten-free month because the doctors don't think that gluten is the problem and therefore won't test me for it. I've read up on it and I don't seem to have most of the symptoms (and nothing really stomach related) so I'm hopeful! Thank you very much for your advice. :) I'll mention in a future post if this month made a difference or not. I regularly read your blog, but have never commented before, but this post strikes home for me. A couple years ago I approached my doctor saying the same thing, I was exhausted all the time, sleeping 12 hours a night and still needing a nap. Her response "Well that's not normal", um, duh? So they ran a full blood work-up and everything was normal, so that was the last I heard about it from her. I felt like I got the giant brush off. Finally I went to see a naturopath who ran food allergy tests and I found out I was sensitive to things I ate frequently and cutting those out has helped a lot. Also, even though I didn't show as sensitive to gluten, I find when I cut back on it as much as I can (but I love eating it and baking with it, so it's hard to do all the time), I find it helped with my exhaustion and headaches (which I was getting frequently, but they weren't horrible). I'm not the healthiest of eaters, but I find when I am better I feel better. Iron rich foods (spinach and kale) and more protein. I would highly suggest seeing a naturopath if you have access to one. Hi Mandie! Thanks for taking the time to leave a comment. That sounds exactly like me. And the same with the doctors. I mentioned in the comments that I was going to the doctor again and would mention it and I did. I was told to drink tea. And I asked her, "Are you sure it can't be food related?" and was told, "No no no… definitely not." I'll have to look into naturopaths. I already know I'm allergic (but not seriously) to almost everything, but those tests were done 10-12 years ago. Maybe I should be checked out again to see what's going on with that. Thanks again for taking the time to write me! I really appreciate it. Oh Erin, I am so sorry about your fatigue issues. I can relate somewhat. I used to be always tired, unmotivated and kinda blue especially during grey Canadian winter in BC. Now that we are in Asia it has totally changed. Sunshine might be one reason, but I think way more exercise (we walk almost everywhere) and much more fruit&vegetables; in our diets and cutting back on wheat and grain products have much to do with it too. Also, do you have much stress in your life? My husband says this is a major reason why he feels so much better here. Oh now :( Living out of balance/harmony can be very stressful. But there is probably not much you can do about that. I think I remember reading you went to Germany to follow your love? Not sure what to say here, but I soo hope you can feel better soon. This sounds so delicious! I love that it's a tea latte and nt coffee too! I don't snore. One thing I don't have a problem with. :) And I don't think it's sleep apnea. One theory is that I don't enter the deep sleep stage, so I don't sleep properly and therefore am constantly tired. It makes sense, but who knows. Thanks for the tip! No entering the deep sleep stage is the problem with sleep apnea! It is really worth the test, you may be surprised! Before I was diagnosed with sleep apnea, I was unable to find a solution to my tiredness. Do you snore? Could it be sleep apnea – I have it, if you want to chat sometime about it, I'm here! This chai latte looks amazing!! OMG erin, what i would give to have a huge mug of this right now instead of my morning coffee. you totally just made my day. PINNING this recipe. I cannot stop drooling over it! After work, I am usually exhausted as well. I do drink a lot of coffee but black tea is a nice switch up every now and then! I hate knowing that you are not feeling well my friend. Please, please, say that you will give it a try. This is going to sound terrible, but I just need to make some dinner rolls to post for Thanksgiving and then I will try going gluten free. And you're right, it's better to try than just wait. I've asked the doctors about the problem being food but they've all said no. I'll try anyway because it can't hurt. And then I can stop wondering! Thanks for your advice. I will try it so don't worry. :) I'll let you know when I start! And I will be there to support you, my friend! And I can't believe the doctors would rule out food as being the culprit. It's the first thing I would look at! It's only logical. It's almost like they're saying "cigarettes and coffee have nothing to do with bad breath, we obviously have to look some place else". Same kind of nonesense. Well, to me, anyways. Hi! I haven't heard about that book but I'll definitely check it out. I'm happy to hear that it's helped you with your health. :) And thanks for your very sweet comment. It gave me a big smile. :) Sometimes I feel like I'm a bit negative on here so I'm happy that I don't come across that way! This drink looks really appetizing right now? I need something warm :-) and even though I don't like pumpkin much I could probably drink this no problems. Have you tried to test and see if you have any nutritional deficiencies? You could have low iron and magnesium. Symptoms are tiredness, fatigue and headaches…..just a thought. Taking a mineral supplement may do you some good but testing for iron deficiencies is something rather simple and that could be the answer. You are great and so patient to hear everyone's health suggestions. I have two cents to add… have you considered low thyroid? I think I went through a period of low thyroid and took a certain vitamin that returned it to normal. Like you, I had lots of fatigue. This recipe looks and sounds amazing and I hope to give it a go after I make some fresh pumpkin puree!!! Thank you for posting!! I love pumpkin chai lattes! Now I can make them myself! This could be bad. . . What?! No! This is totally healthy other than the maple syrup. But such a small amount! Sounds like you have gluten intolerance. Google headaches, fattige, and gluten intolerance to read. Best test is stool test. Blood test not reliable. You have to be off gluten for 6 months to a year before it leaves your body. Thank you! :) And I hope you like the tea. Let me know how it goes! This recipe looks great! I like tea, and I like tea lattes, but I have the hardest time figuring out how to make tasty ones at home. Brewing it in the milk seems like it might do the trick! Regarding your sleepiness, I might recommend Vitamin D3. Your doctor might have checked your levels for this, so perhaps my advice is unnecessary. I was vitamin D deficient until this past spring when my doctor thought to test my levels because I always felt energy deprived and slightly depressed. I have been taking 3000 IU with the hopes of bringing my levels into normal range (each 1000 IU brings your level up 10 points, in theory). When I take my Vitamin D3, I have much more energy, motivation, and a bit more cheer in my life. When I don't take it for a few days, well, I get a bit tired and mopey. I'm actually a little Vitamin D deficient, but the doctor said that my levels were only very slightly off. I've been reading up on it and I think I'll try it out anyway. I'm happy that you were able to find something that worked for you! It must be a huge relief. Thank you for the tip! I'm not a tea fan but this sounds really nice. I'm sorry you're stilling having headaches. And as for the sleepiness j sometimes feel really sleepy after school. And when I feel sleepy and know I shouldn't sleep I move around. Take a small walk around the neighborhood. And if that doesn't work, bake. That also works really well for me. Just getting the ingredients and measuring them out kind of kicks my brain into gear. But Becca, neither am I! I still can't stand the stuff unless it's made with milk and there's lots of spice to kill the tea taste. I like your tips. I think maybe that's my problem. When I'm tired, I take a ridiculously long nap and then wake up even more tired. I definitely don't move around. What I've started doing is getting up and dancing (really only flailing about) to some wake-up music. And baking is good too! I always feel more awake after baking, but as soon as it's out of the oven and pictures are taken, I crash. Then I'm useless for the rest of the day. Oh my goodness. Would LOVE one of these right now. Looks SO warm and comforting! Yup! I'm at the doctor just about every week for the headaches. She's done all kinds of tests on me but everything appears to be normal. I hope you can stop that medication at some point. It's an especially terrible time of the year for brain fog / fatigue. Incredible! My hubby will love this! Erin replies to Loretta E.
Wow this looks so delicious and autumn-y :-)love it! This sounds unreal! What an awesome recipe! what a coincidence that you posted this recipe on one of the days of the dead since it is very similar to a Mexican drink called Pumpkin Atole- Atole is made by boiling corn flour in milk with sugar and warming spices. Pumpkin or chocolate can be added. Its a delicious warm breakfast. Oh my goodness, I just made this and its delicious! So warm and comforting. Do you exercise Erin? Has your energy level only dipped since fall began? Just wondering if you perhaps suffer from Seasonal Affective Disorder. Hopefully your energy will return soon. Thank you for this yummy recipe! 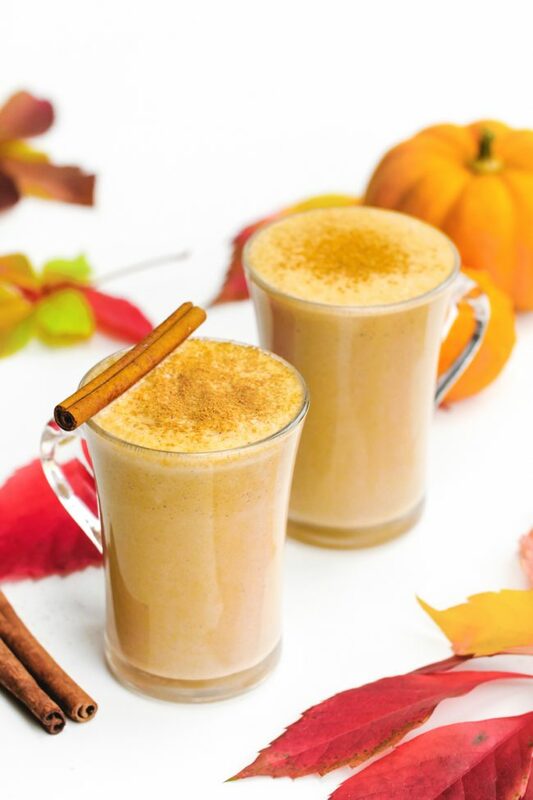 Pumpkin chai sounds like an amazing combination – yum! Thank you for this recipe Erin! Just opening up a can of pumpkin puree for muffins and didn’t know what to do with the rest of it. This drink sounds delicious and just in time to celebrate this beautiful autumn we are having in Vermont! And you may think about taking magnesium. It is becoming a great problem with our diets because of the way food is grown. There are many missing minerals in our food. I have been listening to a naturopath/medical doctor that is a huge magnesium advocate and has her own products. Prior to having her own products she recommended and still does recommend the natural calm in the following link. This is also some information on all the ailments people have which may in fact be a result of magnesium deficiency. And also the Magnesium Advocacy Group may be helpful. Thanks for the information and the links! Just looking at it, I have most of those symptoms so I’ll definitely look into it. I hope you enjoyed the pumpkin chai latte. :) Thanks again!